December sales activity rises again but so does supply. 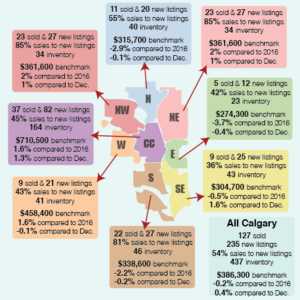 City of Calgary, January 2, 2018 – Sales activity for all product types improved in December and pushed monthly sales to long-term averages for the second month in a row. “Many of the economic indicators continue to post modest improvements, including improving sales. However, demand gains have not outpaced the additional supply coming into the housing market. This is creating some of the bumpiness in terms of price recovery,” said CREB® chief economist Ann-Marie Lurie, who added that prices have stayed comparable to last year. Overall, the detached benchmark price in 2017 averaged $504,867, 0.63 per cent above last year’s levels. In the attached sector, the first half of the year saw an improvement in sales relative to inventory levels. This supported stronger price gains in the second and third quarter. However, a late rise in inventory levels took some of the momentum away from price growth. On an annual basis, attached prices totaled $332,325, comparable to last year’s levels. “This year, we saw a rise in the number of consumers willing to purchase in the market with the expectation that the economy had already shifted. There were also many who waited to list their property until prices showed more stability,” said CREB® president David P. Brown.